Operating at peak efficiency and maximizing utilization requires continuous knowledge about what your fleet is doing. Our solution gets you that data, so you can act on it quickly. Profitability can hinge entirely on how well you utilize your resources, whether looking at fuel consumption or utilization rates. Reduce operational costs based on timely data. Increase safety by using condition monitoring, and trigger emergency protocols based on set thresholds and conditions. Your operators will thank you for taking safety so seriously. Access Your Fleet from Anywhere. 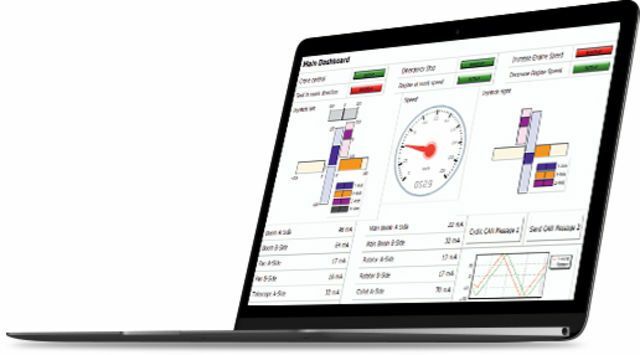 Manage your assets online, and visualize telemetry data from all connected machines using the Data Portal. Get more out of your data and create advanced plots and reports using our Data Portal. View the current state of your machine, and deep-dive into its historic data. Offering a modern, customizable, responsive look-and-feel you can consume the data from any device. The realtime mode – a remote diagnostics tunnel – gives you a direct global connection to your machine's CAN-bus via the internet by using a CANlink® mobile (LTE/3G/2G) as the gateway. This allows you to stream and view your machine's CAN data in real time directly on your computer. Moreover, you can save the CAN data of any realtime session locally and play it back at a later time. By integrating the realtime client in your existing OEM service tool, your service technicians can connect to any machine remotely, and for example perform a diagnosis session or remote update (FOTA). Our data platform offers you a powerful fleet management tool. 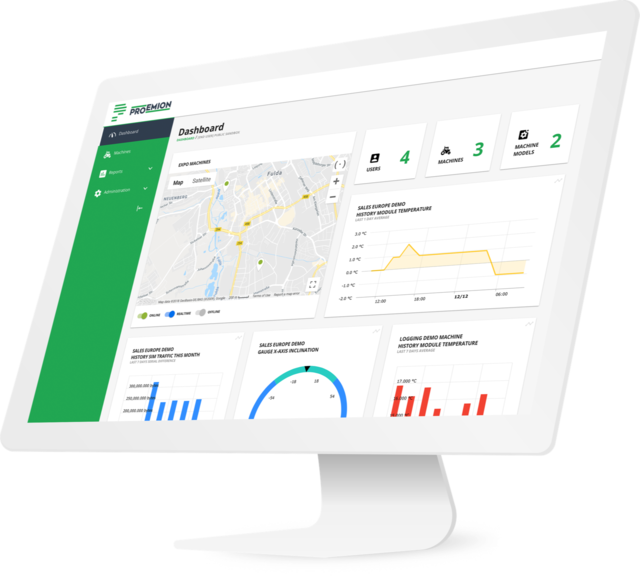 By remotely connecting all your machines, and placing all your data in the cloud – you gain full access to the operations and performance of your entire fleet from one access point. Our robust API enables your developers to develop powerful business tools that turn your data into strategic insights. You will be able to see real-time telemetry and sensor data from your entire fleet, which will all be stored safely in the cloud. The right hardware to connect your machines to the cloud (IoT). Our hardware is built to withstand heavy off-road usage, and plugs into the machine’s CAN communication bus. Using the embedded SIM, it acts as a wireless gateway enabling global data transfer in both directions. Our CAN hardware can be quickly configured for any CAN protocol. The embedded SIM enables bidirectional data transfer, allowing remote firmware updates for all CAN components, anywhere in the world and at any time. Proemion offers tailored OEM solutions, right at the point of manufacture. Various customization options are also available such as hardware modifications, firmware adaptions, or custom GUIs. We offer end-to-end support for solutions based on our embedded systems and web services during conception, implementation, and roll-out. Our engineers and product designers are here to help.